Rydal Dam is part of the Fish River water supply, the only scheme in eastern Australia to transfer western flowing water east of the Great Dividing Range. Conceived in the 1940s to supply water to the shale oil industry, the scheme now supplies water for the power station at Mount Piper and other villages in the area, as well as meeting stock and domestic needs in the Oberon, Lithgow and Blue Mountains areas. Rydal Dam is not open for public access. Rydal Dam is 2 kilometres north of Rydal and about 20 kilometres west of Lithgow on the NSW Central Tablelands. Rydal is about 170 kilometres west of Sydney via the Great Western Highway and Old Western Road. Rydal Dam is about 2 kilometres north of Rydal and about 20 kilometres west of Lithgow on the NSW Central Tablelands. The dam is about 170 kilometres west of Sydney. Rydal Dam has a capacity of 14,000 megalitres. Water is transferred to the dam by pipeline from the Fish River water supply scheme at Oberon for supply to nearby power stations. The Fish River water supply scheme has its origins in chronic water supply problems in the towns of Lithgow, Wallerawang, Portland and Oberon as early as 1937, which were exacerbated by the 1940s drought. Small local schemes were rejected in favour of a regional scheme but funding delays stopped the start of works. World War II and the need for Australian-sourced fuel re-started the project in 1943 with an expanded scope to include water supply to the Glen Davis shale oil works. The early 1950s saw the closure of the shale oil works but the creation of new power stations for electricity generation at Wallerawang. 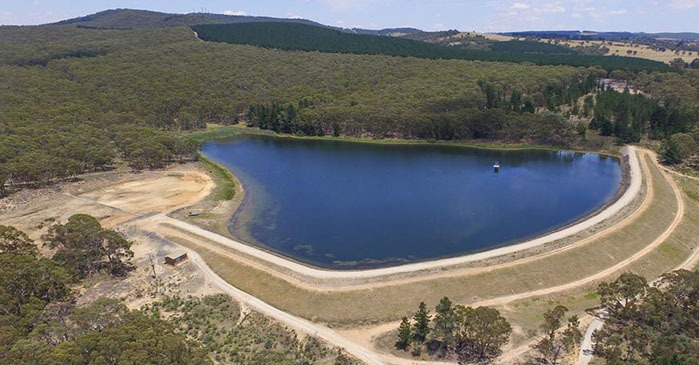 Today the scheme supplies water to Wallerawang and Mount Piper power stations, to Oberon and Lithgow councils for domestic and industry use, and to more than 200 landholders along its length. It also supplements town supplies in the upper Blue Mountains. Rydal Dam is an earth-fill embankment with an uncontrolled channel spillway just to the south. The dam wall is 425 metres long and 16 metres high. The dam was built as part of an expansion of the Fish River water supply scheme between 1954 and 1959 which included a new 54 kilometre long pipeline from Oberon Dam to Wallerawang to increase water supply to the power stations. Rydal Dam was built to ensure reliability of water supply to the power stations. Work on the dam started in 1956 and finished in 1957. To meet modern dam safety standards, in 1996 a fuse plug spillway was built to divert floodwaters around the dam in a rare and extreme flood so as to protect the dam and ensure it remains safe in an extreme flood. The dam’s spillway channel had earlier been widened in 1989. Trigger - Storage level is 600mm from embankment crest.